Make sure you have time to construct the kit. If you are stressed, building the kit will not be very rewarding. And it often leads to mistakes. 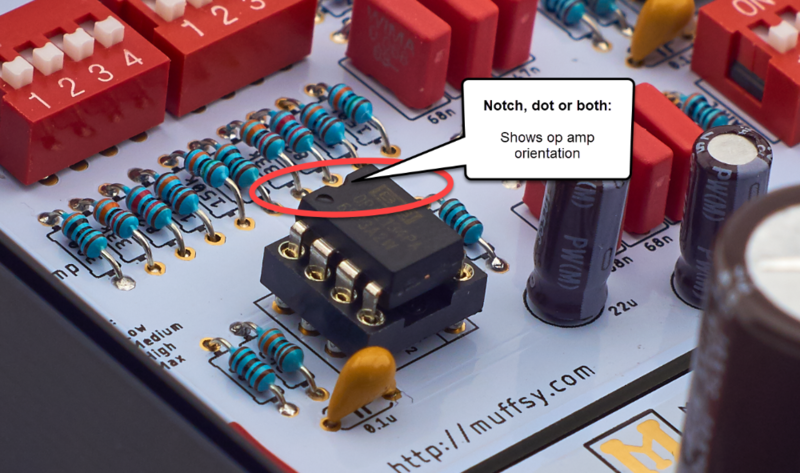 Familiarize yourself with the instructions before you start building the Muffsy Phono Preamp. 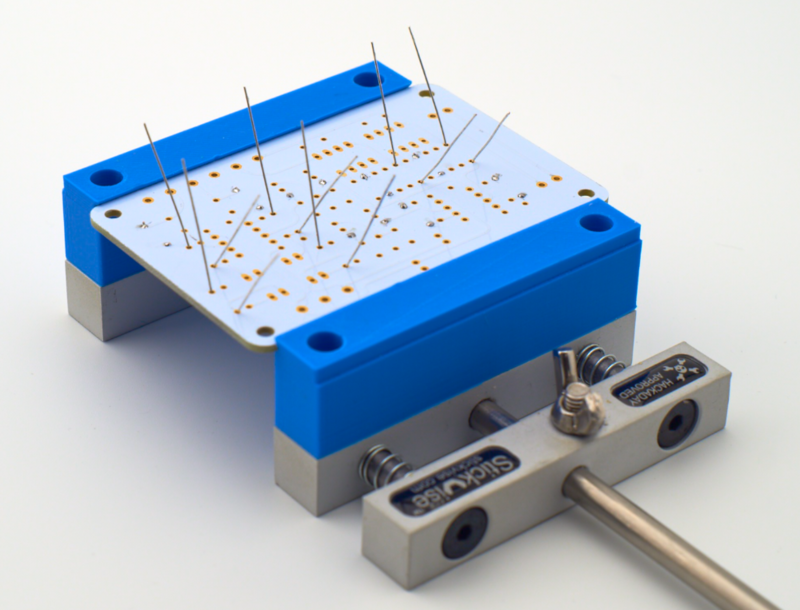 Take the time needed to double-check component values and placements. 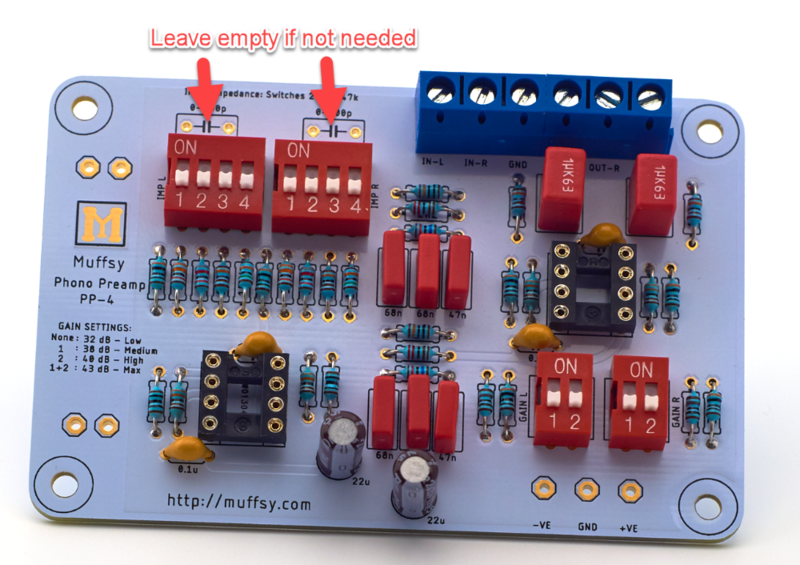 Even if you're not using the Muffsy Power Supply, Back Panel or the B0905 cabinet, the information given here will serve as inspiration for your build. Wash your hands carefully afterwards if you're using leaded solder. Do not lick your fingers or touch any food items while working. 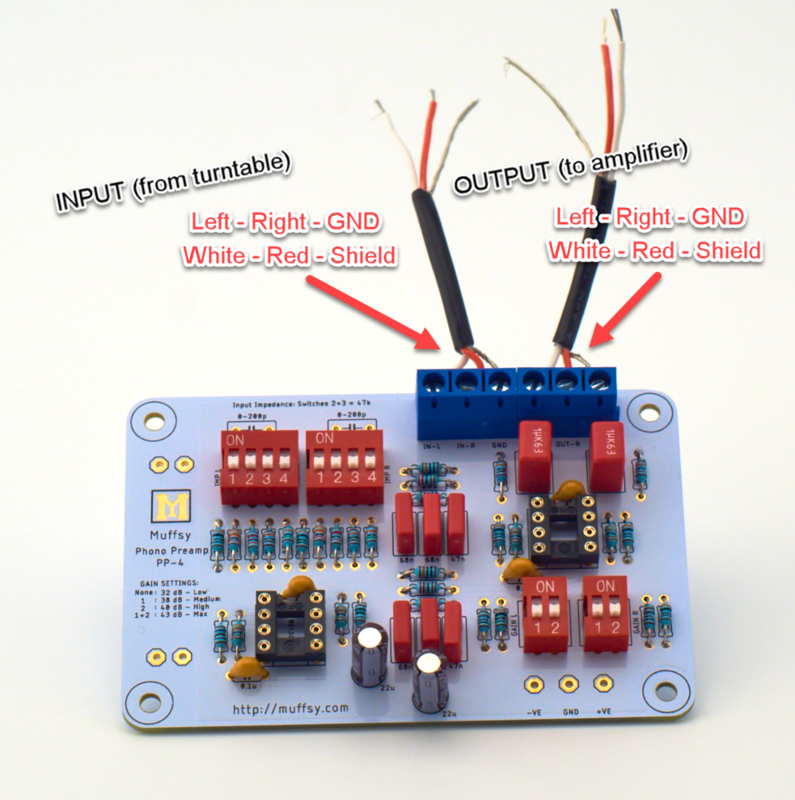 The picture below is a larger version of your printed circuit board. 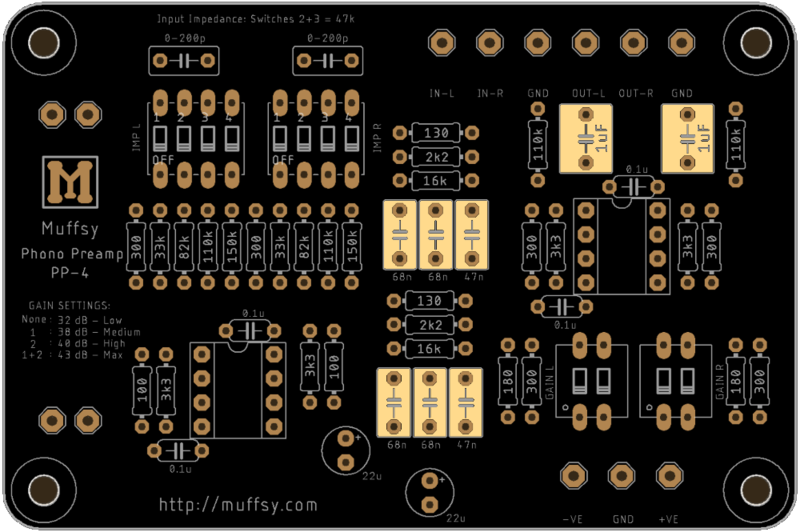 For each step, this will be used to highlight which components you will be adding to the board. You will also get a live view of where you are in the build process. It will show you what each component looks like, and present special information if needed. All resistors are 1/4W, metal film, 1% tolerance. 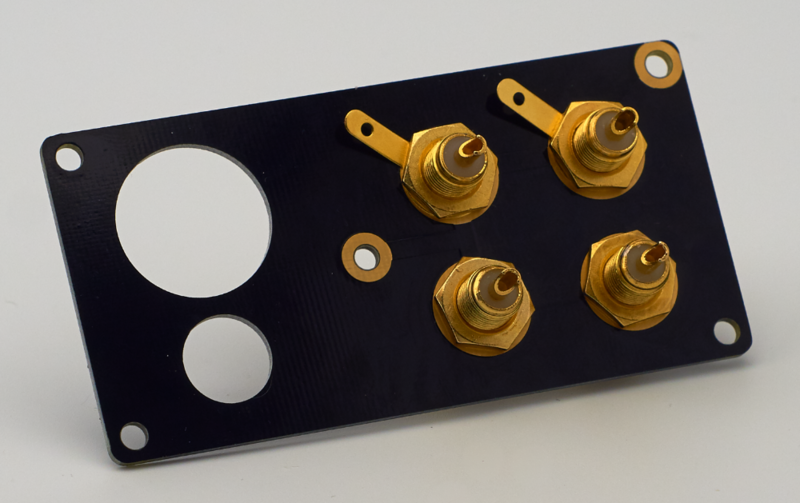 This high quality printed circuit board has plated-through holes. Do not attempt to drill the holes to make them larger, doing so will destroy the board. The four mount holes, one in each corner, may be drilled to size. There is a total of 30 resistors that go onto the printed circuit board. Mount just a few resistors at the time. 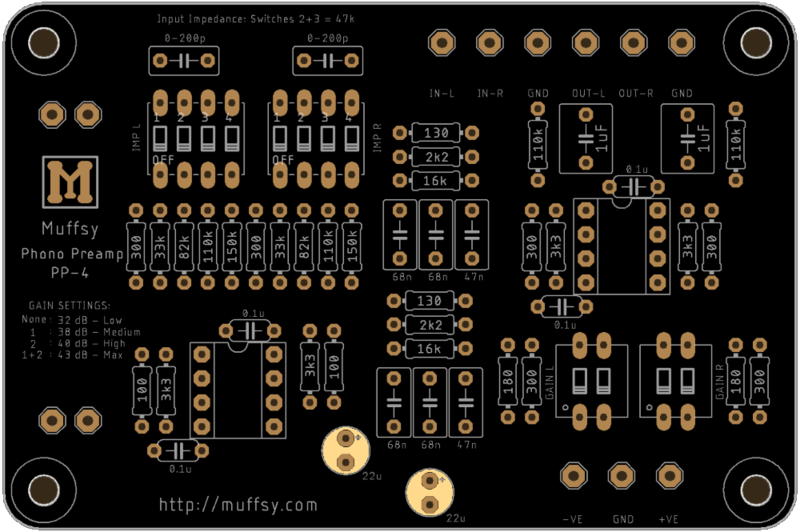 It will be a lot easier to solder them, and there's less chance of confusion. 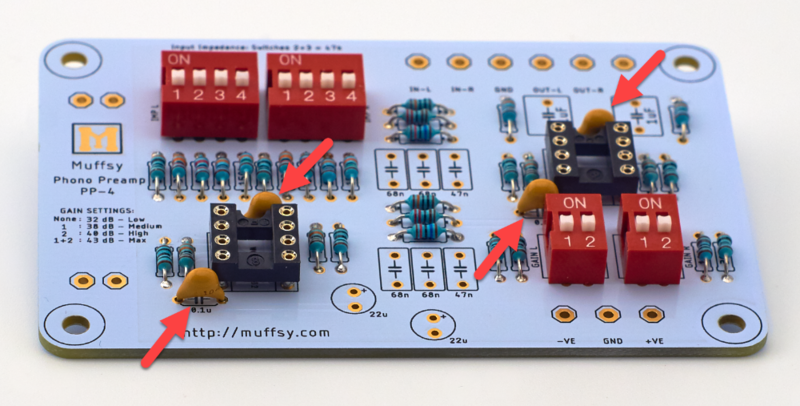 Check and double-check the values before soldering the resistors in place and snip the resistor leads as you go. 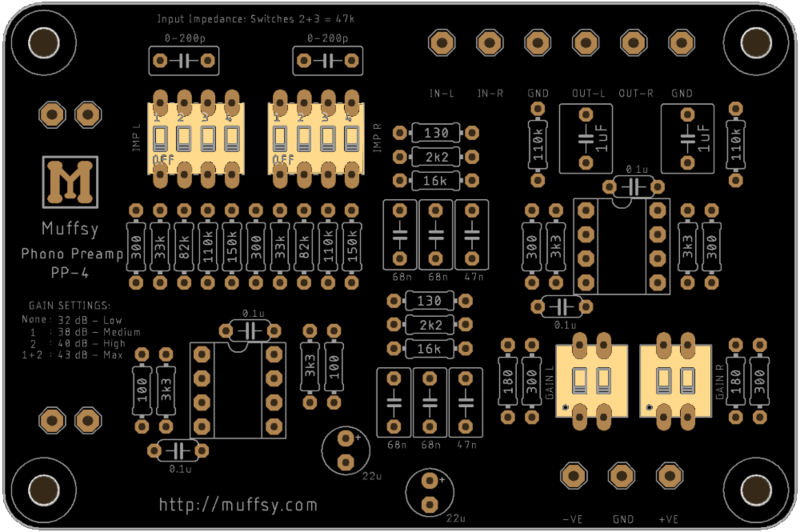 The picture below shows all the resistors soldered in place. 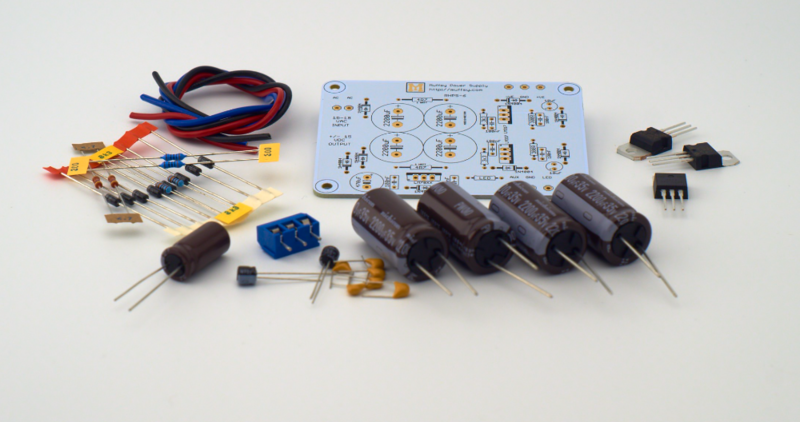 The resistors in the kit all have 1% tolerance and a temperature coefficient of ±50ppm/°C. 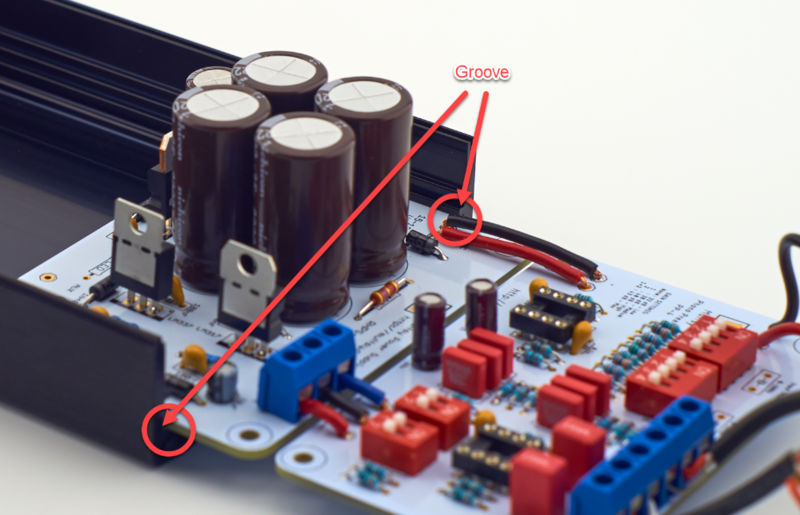 There are four ceramic capacitors on the board, surrounding the op amp sockets. 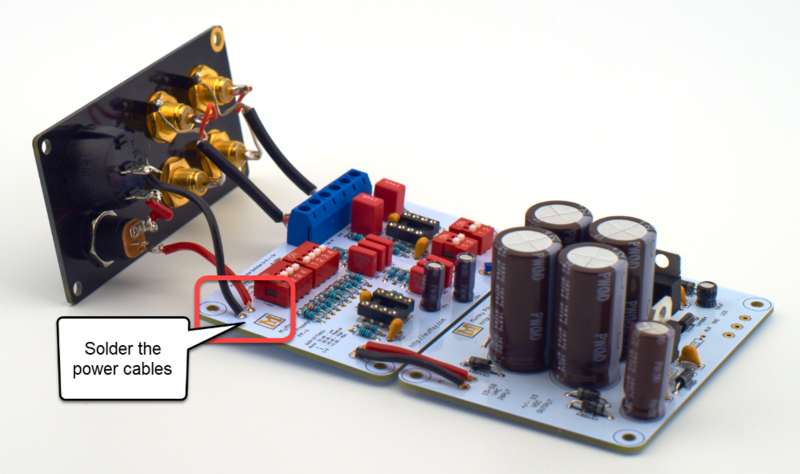 You don't have to worry about the orientation of these capacitors, I like to place them so that the text is showing. There are eight Wima MKS2 capacitors in all. 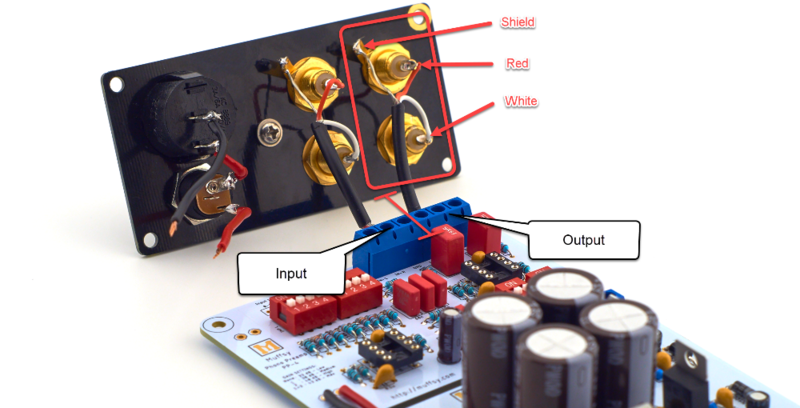 Start with the six capacitors in the RIAA equalization filter before you continue to the two output capacitors. They are bipolar, so orientation is not significant. I still like to place them so that the text is visible. 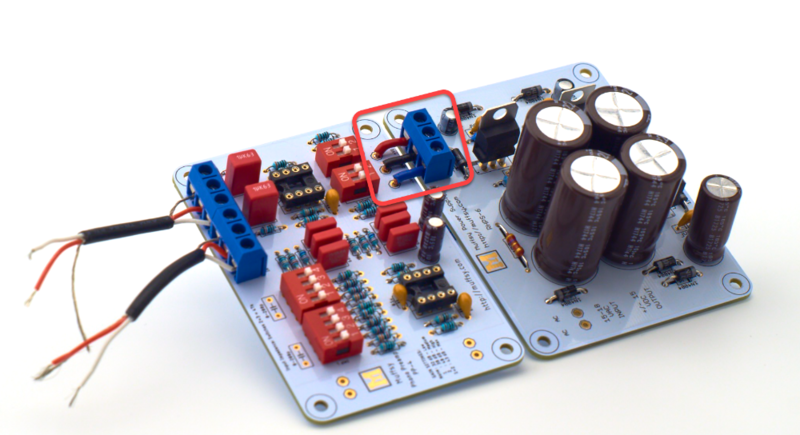 Make sure that the right value capacitor is mounted in the right spot. The four 68 nF and the two 47 nF capacitors are very similar in size. The two 22 uF electrolytic capacitors must be oriented correctly, or there's a chance they will go up in smoke. 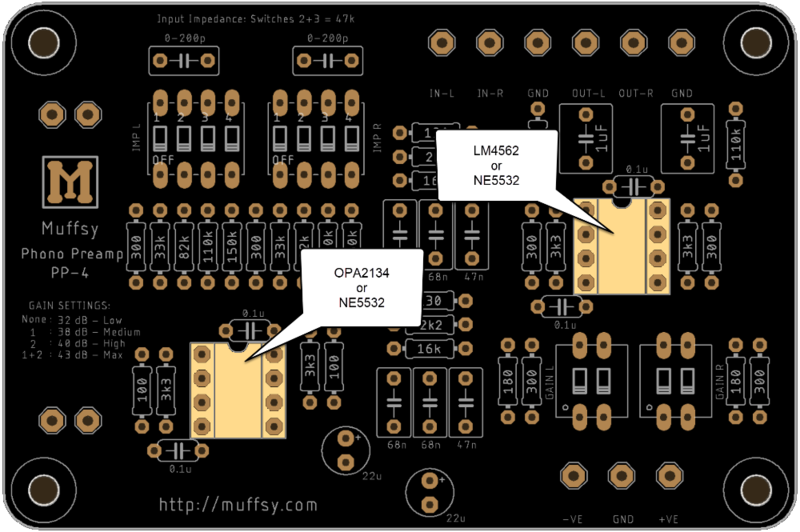 The board shows a plus (+) symbol, this is where the longer leg of the capacitors will go. 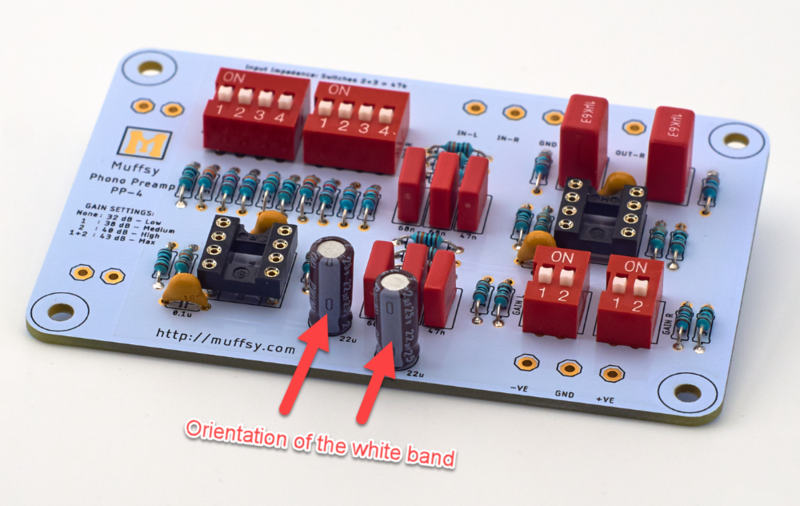 The capacitors have a white band with several minus signs (-), this side has the shorter leg. This minus side goes downward when the board is oriented as shown on the pictures. 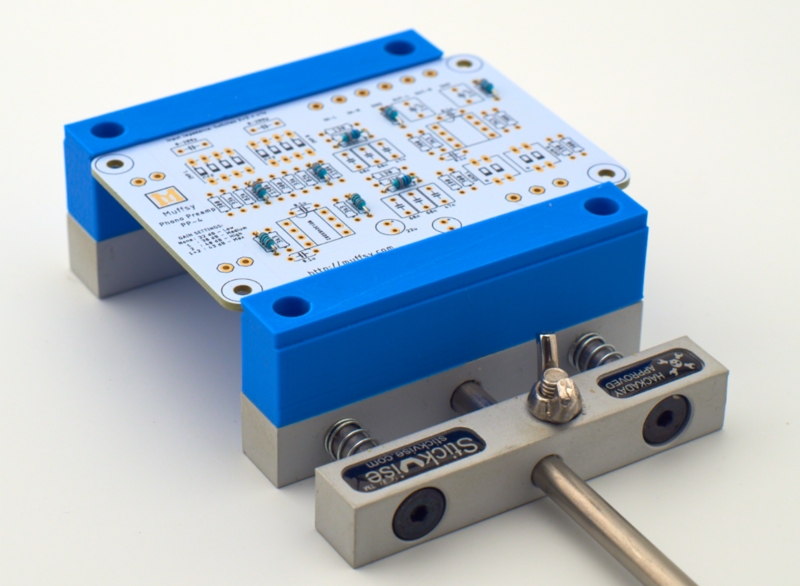 To ease the installation of the input capacitors, use stackable pin headers. Either round ones that you can break off, or square ones where you can cut off the middle pin. Film capacitors with 5 mm / 5.08 mm pin spacing are suitable. 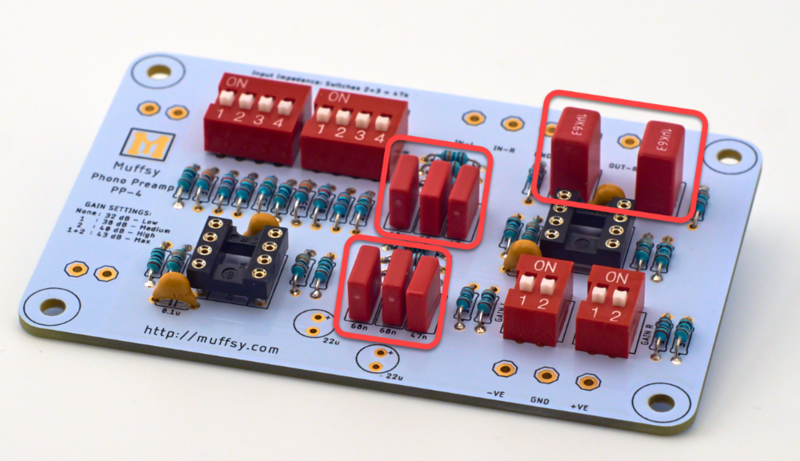 Follow the build instructions for the Muffsy Power Supply v4. Take the four RCA connectors and put the plastic shims on them. 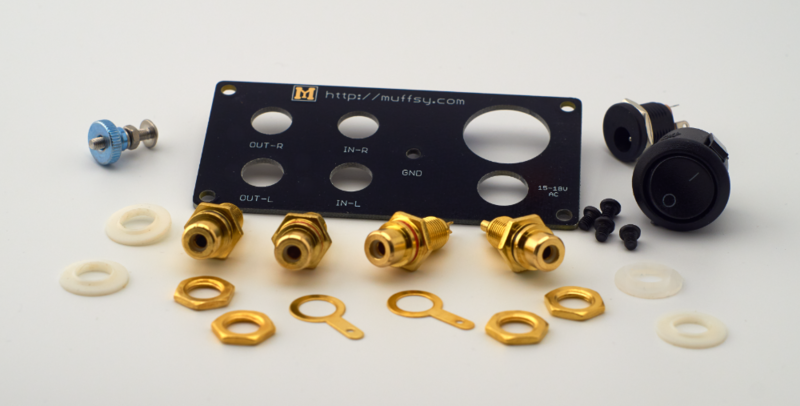 The plastic shims on the front can be left out, but you will find that the connectors are easier to tighten with the shims though. Insert the ground pads on the top two connectors and fasten them with a nut. Fasten the bottom connectors with nuts only. It's a good idea to use a couple of wrenches to make sure the RCA connectors are tightly fastened. 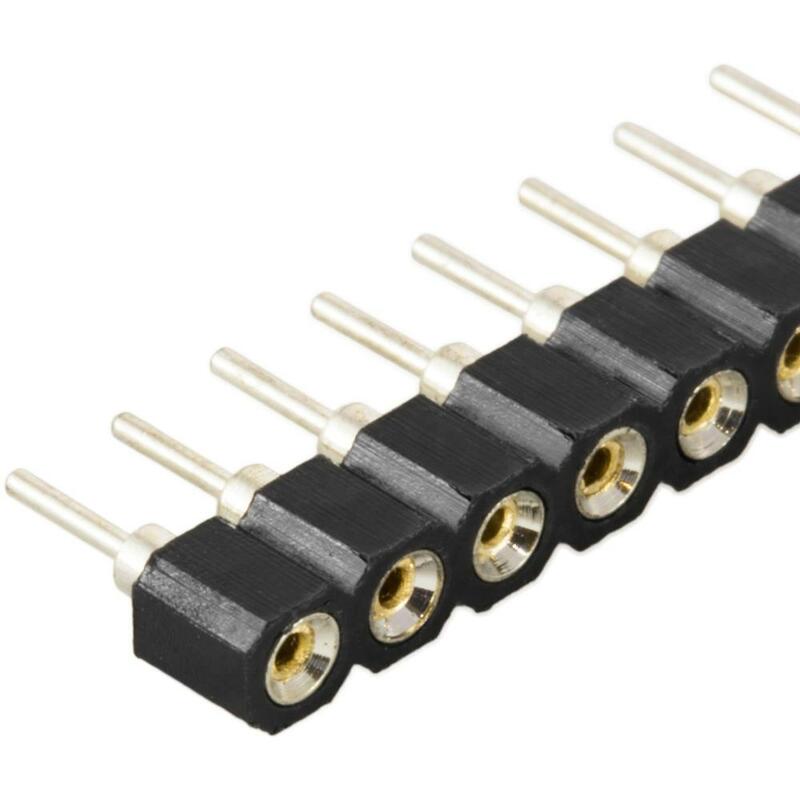 If they are loosened and twisted around, you could snap or short the signal cables connected on the back of the connectors. 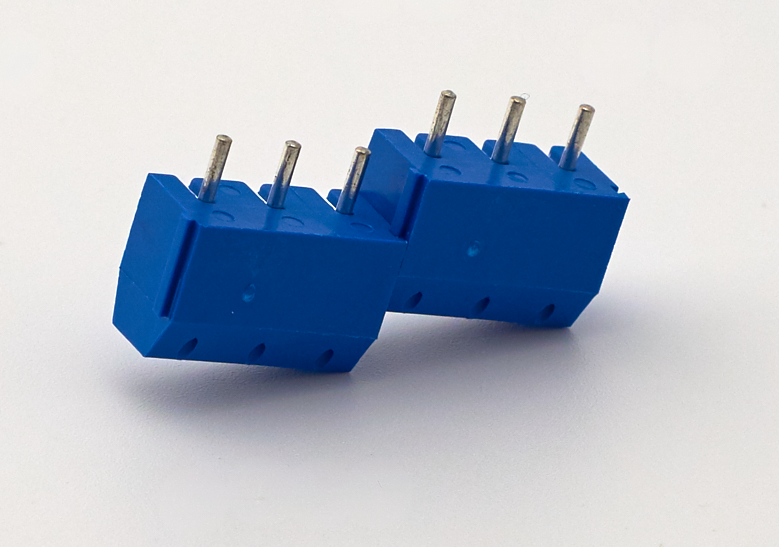 These connectors are electrically connected together inside the back panel, do not use the plastic shims on the back. If you do add these shims, you will get humming and poor sound quality. 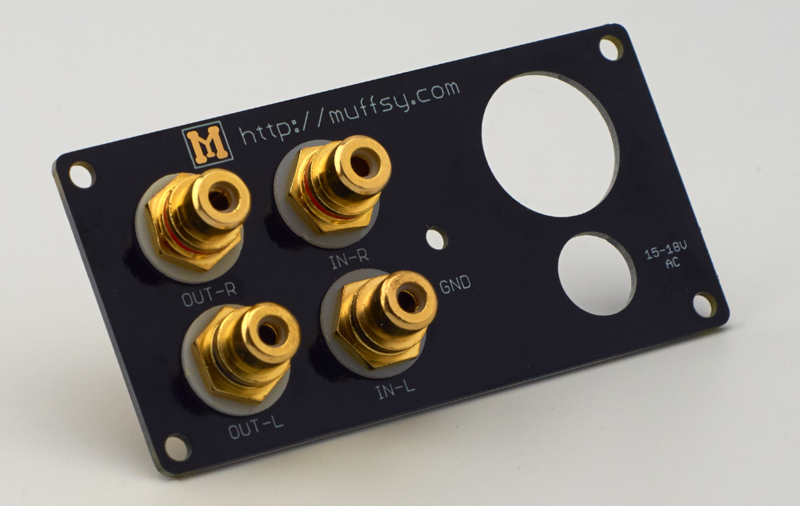 The information below is for the Muffsy Phono Preamp, Muffsy Power Supply and Muffsy Back Panel mounted in a B0905 cabinet. 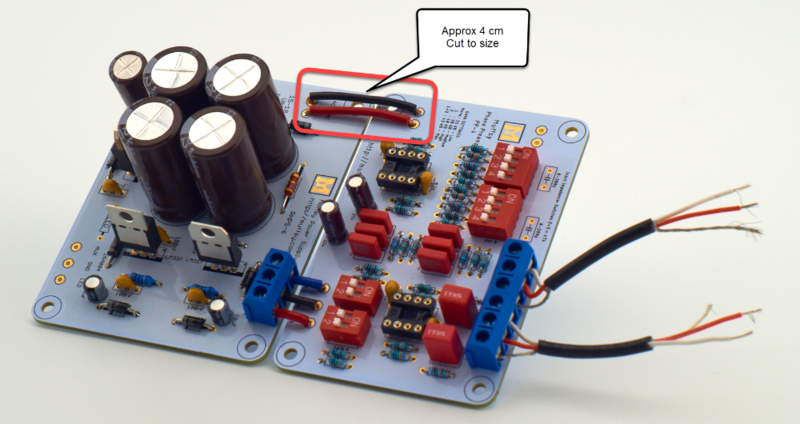 You may want to do this in an entirely different way if you don't have all these components, if you want to incorporate the Muffsy MC Head Amp, or if you want to use a different enclosure. 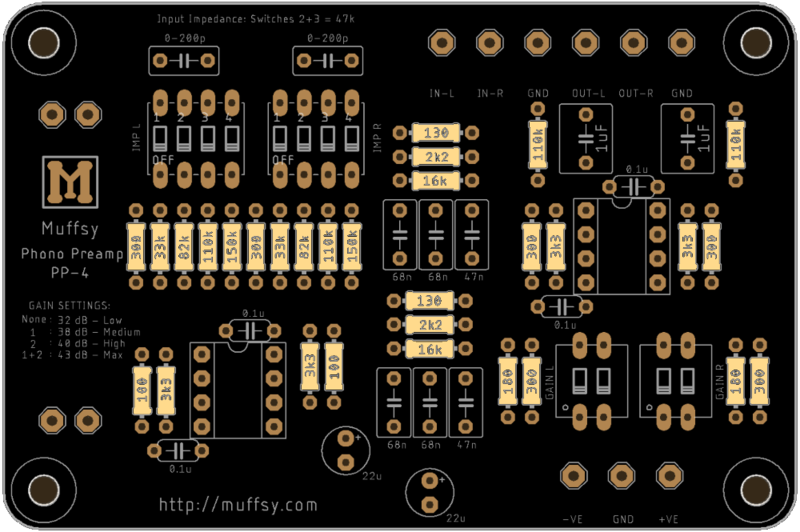 Screw the tinned 1.5 cm ends into the inputs/outputs on the Muffsy Phono Preamp board. Tinning the ends makes it much easier to insert the cables, and they will be even more securely fastened. Connect the tinned end of these three wires to the power output screw terminal on the Muffsy Power Supply. Cut a red and a black piece of wire to size, approx. 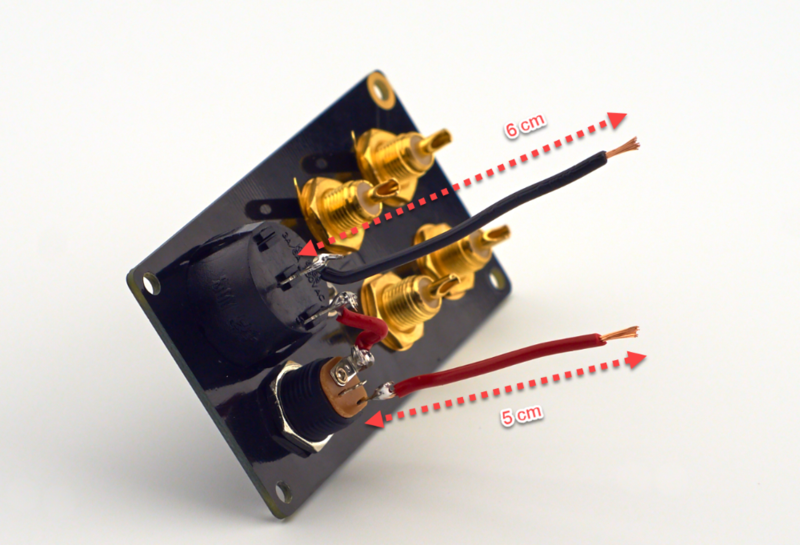 4 cm, and connect the two boards as shown below. It does not matter which color goes where. 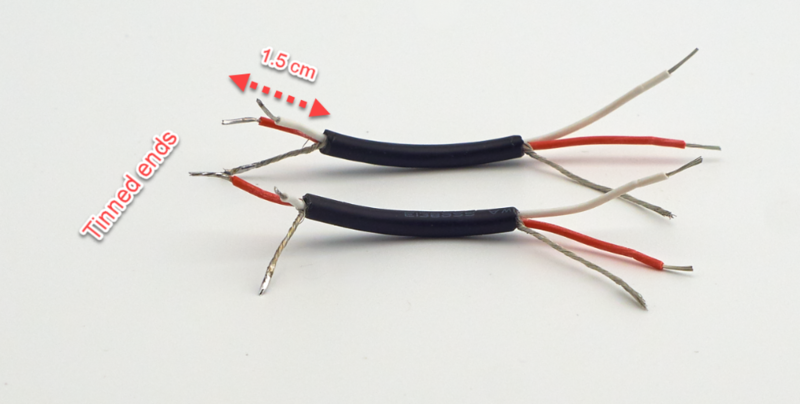 Cut a piece of red wire, ~3 cm, and strip 0.5 cm from each end. Solder this wire between the bottom of the back panel's power button and the L-shaped terminal on the power connector. PLEASE NOTE: Take care not to apply too much heat to the connectors on the power button. The plastic could melt otherwise. (I've used 330 degrees C / 625 degrees F). Cut two cables. Red = 5 cm and Black = 6 cm. Strip ~0.5 cm from both ends of both cables, solder the shorter red cable to the bottom terminal on the power connector (the next one, clockwise from the L-shaped terminal). Solder the black cable to the upper terminal of the power button, making sure not to overheat it. (Again, I've used 330 degrees C / 625 degrees F). Solder the input and output signal cables to the back panel. Solder the red and black power cables from the Muffsy Back Panel to the Muffsy Phono Preamp. 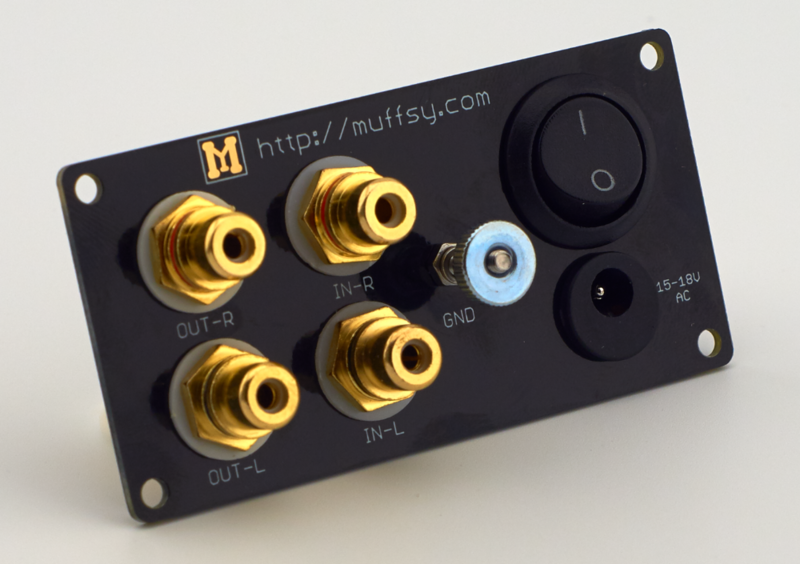 It doesn't really matter which cable goes where, it does look nicer if it matches the cables from the Muffsy Phono Preamp to the Muffsy Power Supply though. 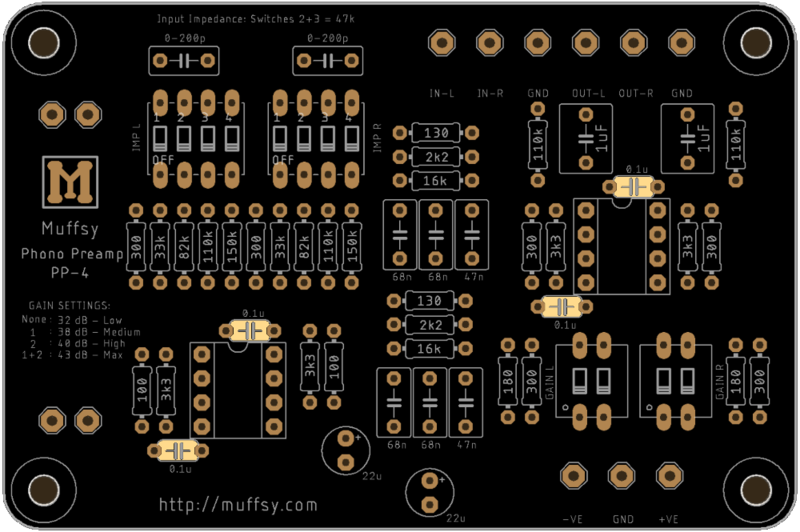 Finally, dab some solder on the corner pad on the Muffsy Back Panel. This will help ground and shield the entire phono stage later on. Use just a small amount of solder and smear it around the pad. 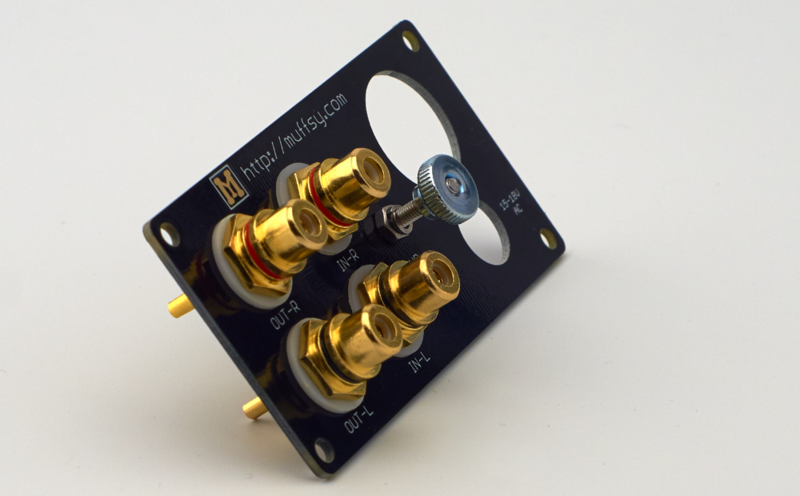 Mounting the Muffsy Phono Preamp in the B0905 cabinet couldn't be easier. 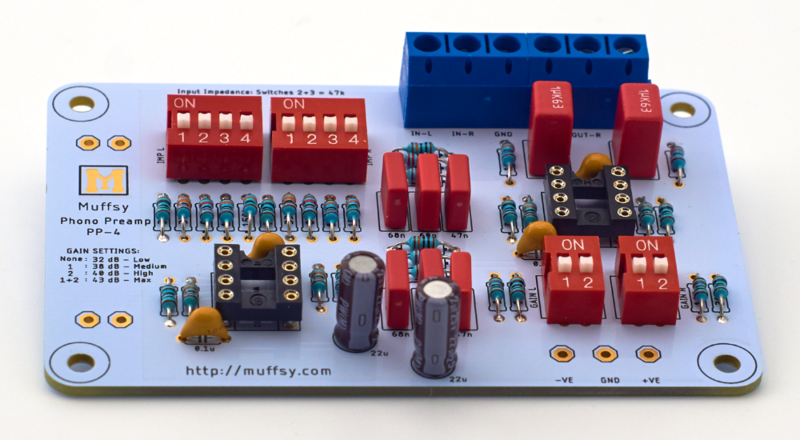 Just slide the boards into the grooves of the cabinet, starting with the Muffsy Power Supply. Screw the back panel in place, using the provided screws. Test fit the upper part of the enclosure to see which way it fits. File or sand away the paint from the upper left corner. 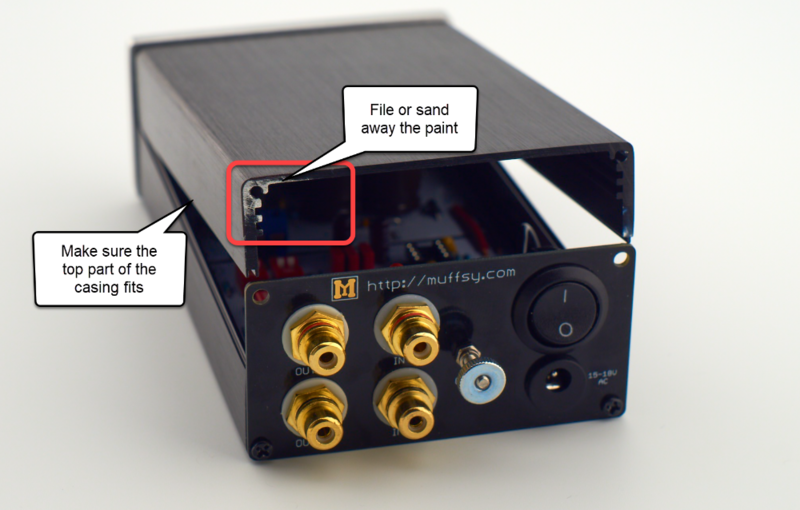 This is where the tinned ground pad on the Muffsy Back Panel connects to the enclosure. 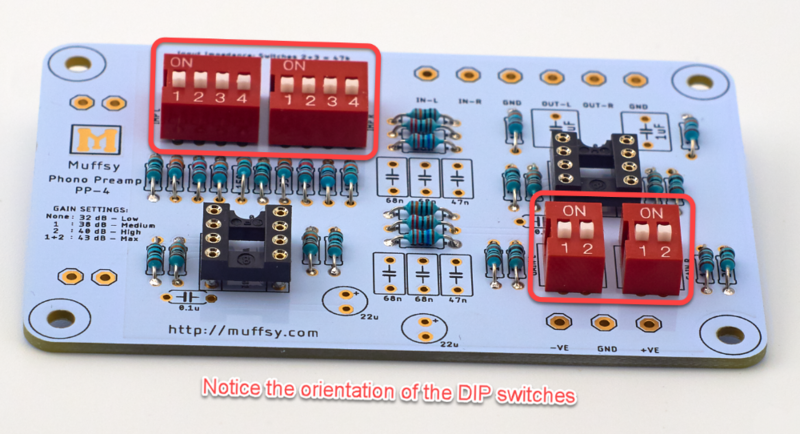 Whether you have ordered the OPA2134/LM4562, NE5532 or decided to use some other operational amplifiers, they have to be mounted in their sockets. 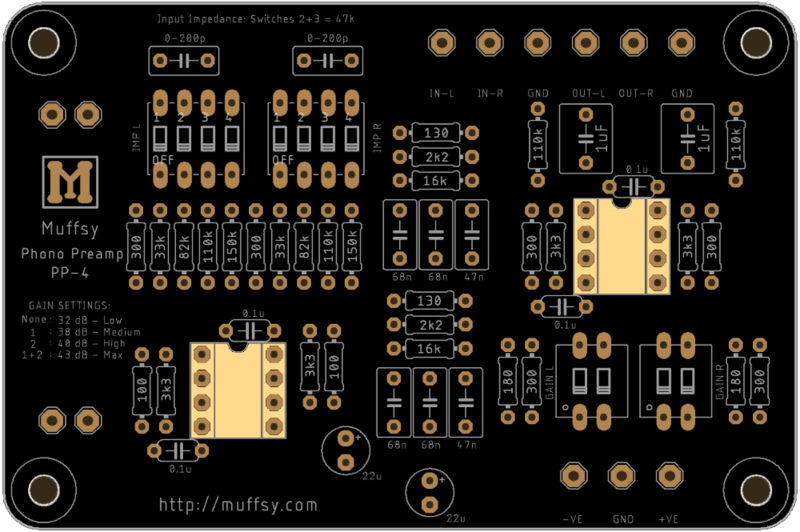 Carefully bend all the pins of the operational amplifiers inwards, so they are more straight. Insert them into their sockets, making sure they are oriented correctly. 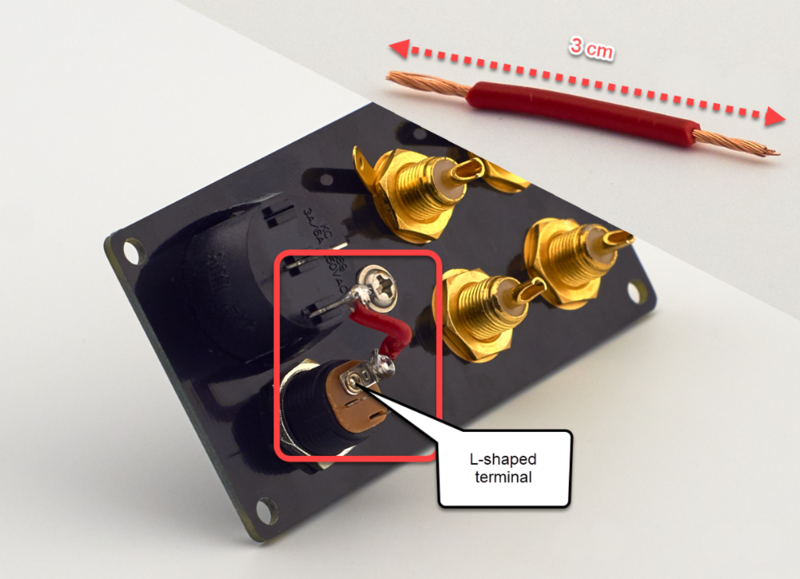 The notch on the operational amplifiers matches the notch on the sockets. It does matter which operational amplifiers go where. For lowest noise and the best sound quality, follow the pictures below. 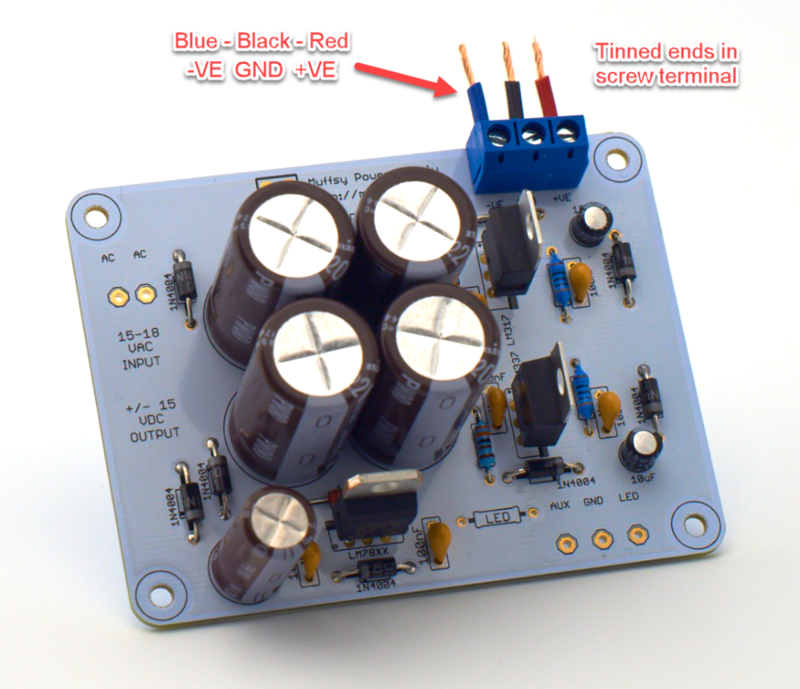 Wondering how to tell which way to orient the operational amplifiers? 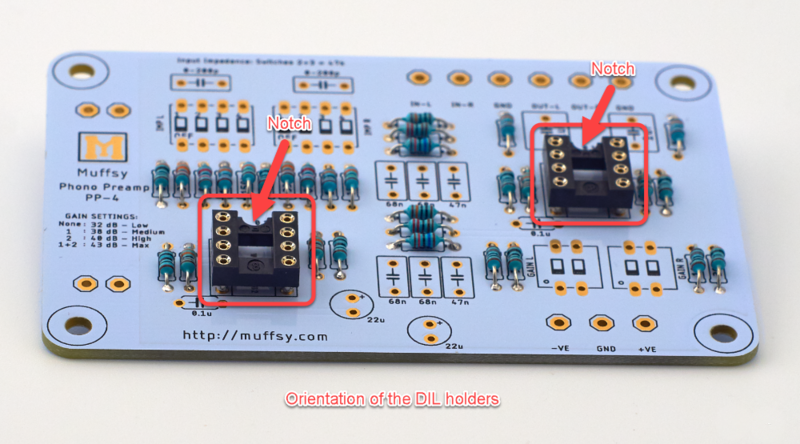 The markings on the board and on the DIL holders have a notch in them. 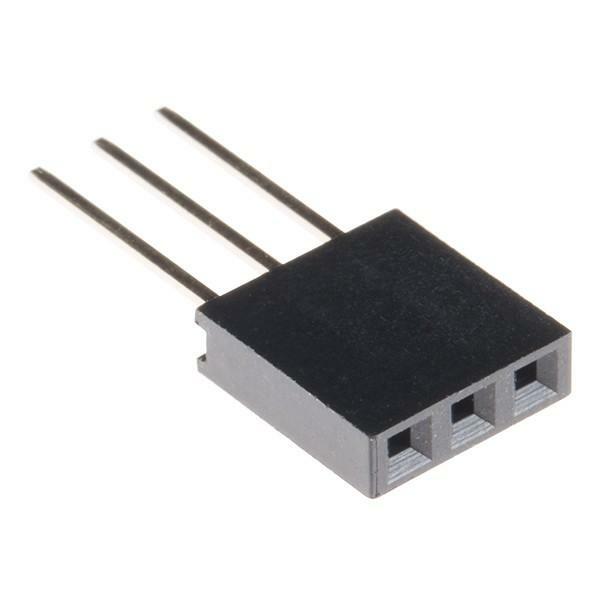 Match this with a similar notch, dot, or both, on the operational amplifier. 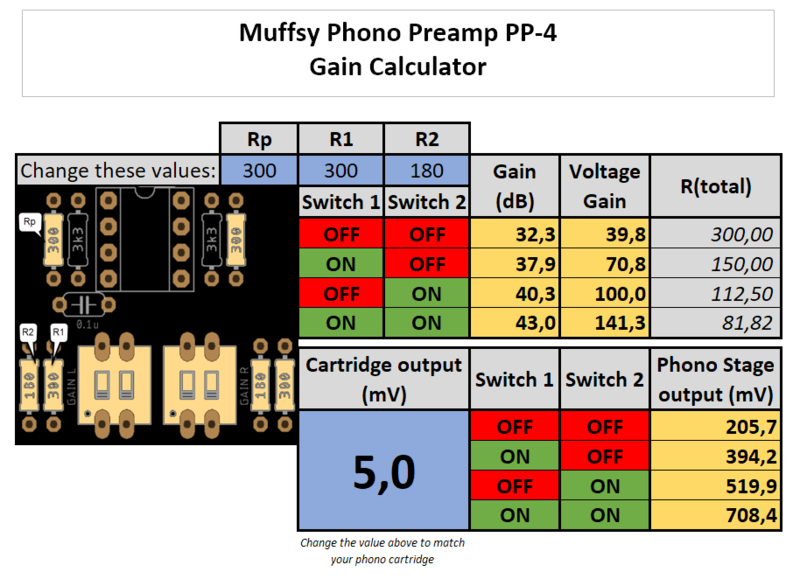 The final step is to set the input impedance and amplification level on the Muffsy Phono Preamp. 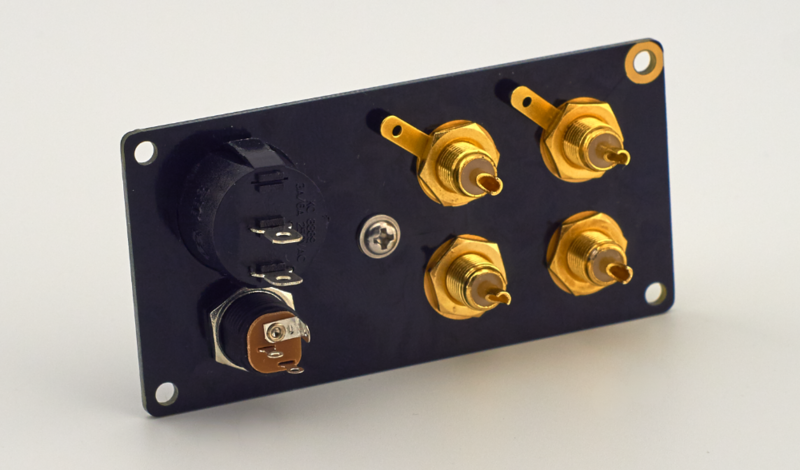 The switches to the top left, the ones with four settings, are used for setting the input impedance. 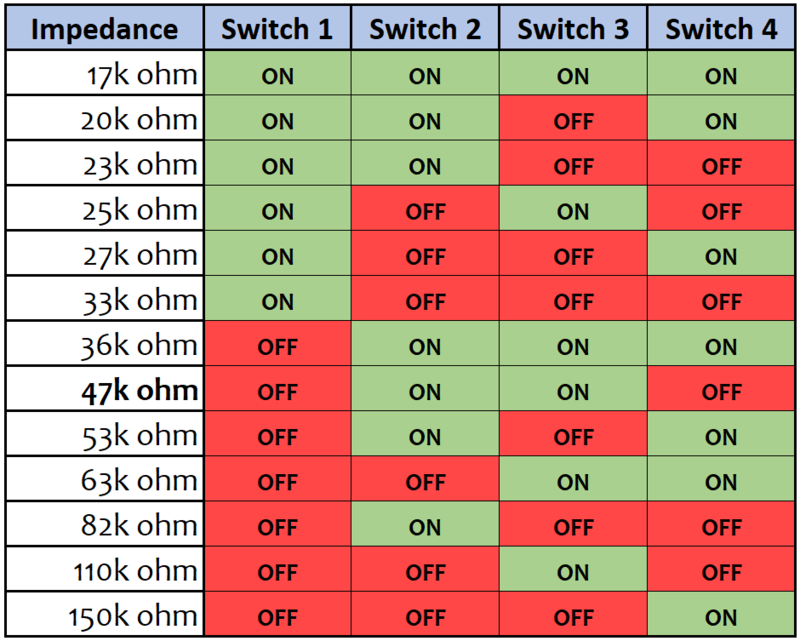 The default setting is to set switches 2 and 3 to on, which will give you 47k ohms. Please note that the input impedance switches must be set. 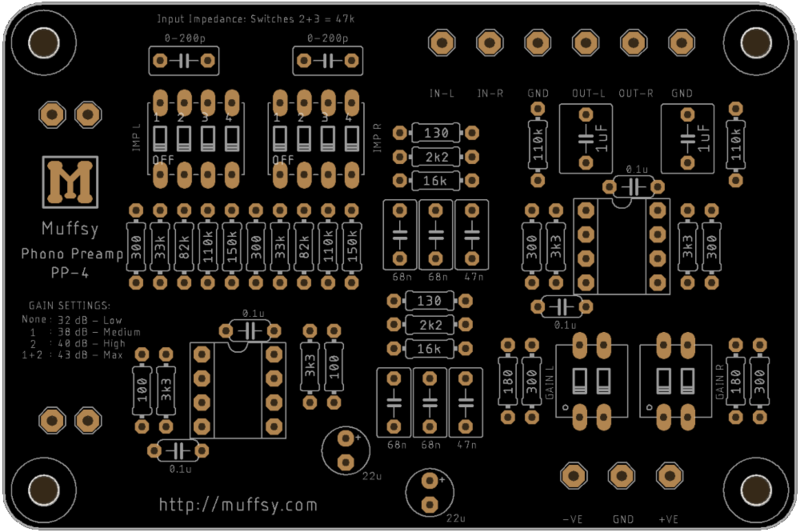 Setting all the switches to OFF will make the Muffsy Phono Preamp sound awful. 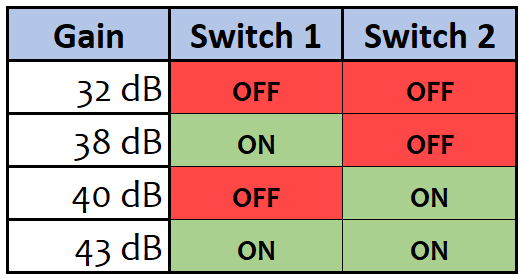 Do also make sure that the settings are identical on both switches. The gain settings are controlled by the two switches on the bottom right, the ones with two settings. The gain settings are really different volume presets. 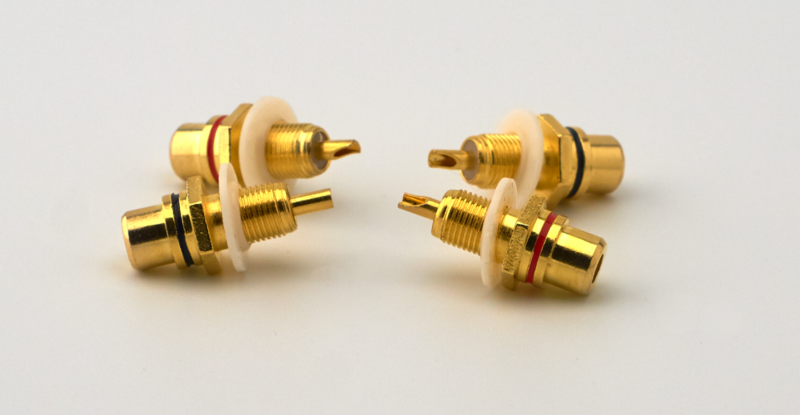 This allows you to match the cartridge on your turntable with your amplifier. Make sure that the settings are identical on both switches, or the volume will be different on the left and right channels. 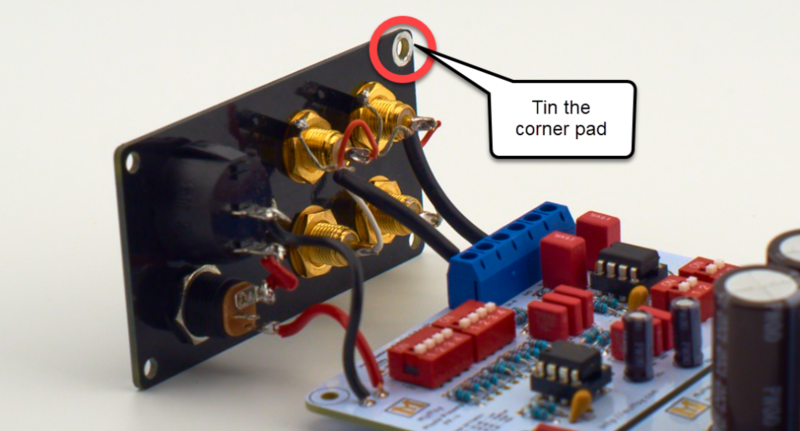 You can modify the gain by altering six resistors. Visit this page to learn more. 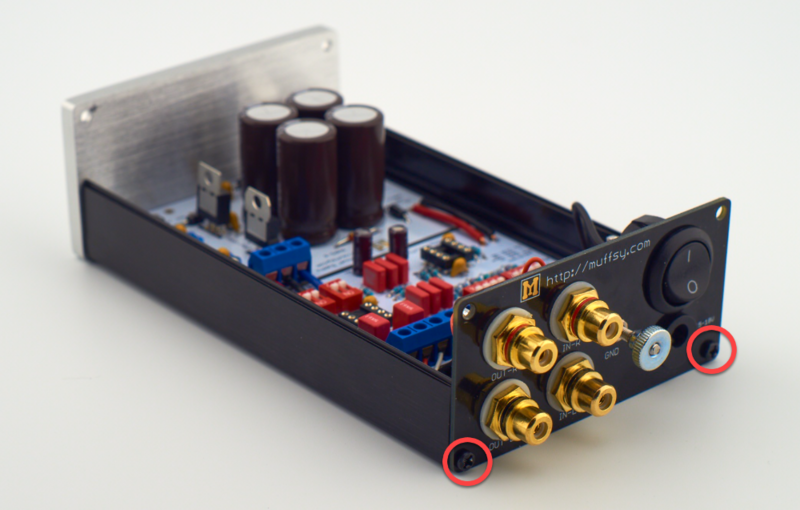 You may want to sanity check your new phono stage before powering it on. 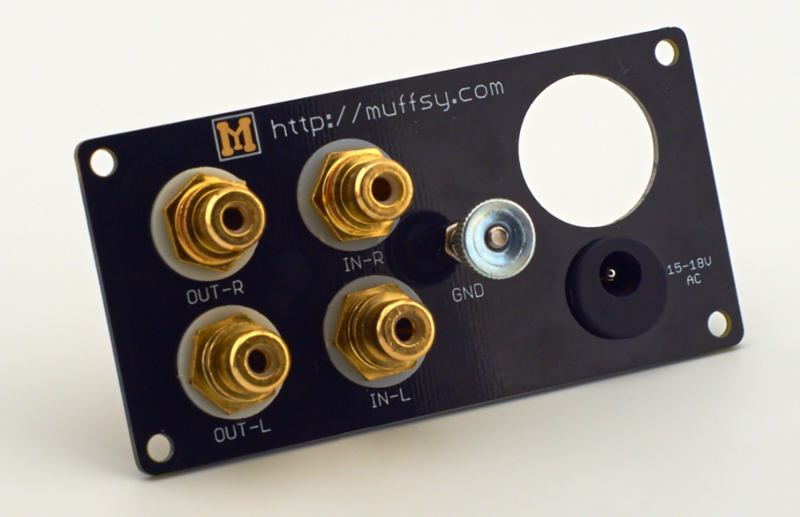 Or perhaps you can't get your Muffsy Phono Preamp to work?